Susan Rice can't stop lying. I suspect this is why Obama likes her so much. Colleville-sur-Mer, France (CNN) – Defending President Barack Obama’s foreign policy as one of global leadership – rather than the passive stance his critics portray – National Security Adviser Susan Rice said Friday the United States was taking important steps in Syria by offering both “lethal and non-lethal” aid to the moderate opposition fighting a bloody civil war. Critics have cited Obama’s record in Syria as evidence of a failed foreign policy, saying his decision to forgo air strikes after Assad deployed chemical weapons displayed weakness to rivals. 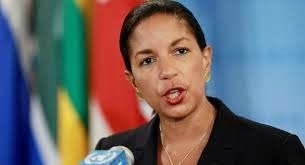 Rice countered those claims by pointing to still-strong alliances between the U.S. and partner nations.